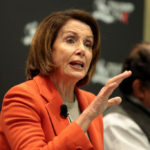 And as we have seen, he has again overestimated his assumed manly authority: Pelosi is battle-hardened after decades in the trenches against a force field that even included resistance among some Democrats who cringed at her feisty presence in their party. She isn’t a woman who will simply make dinner and then reach for a knitting needle. After the feathery management of the Trump initiatives in the House by Republican Paul Ryan, she is exactly what the nation needs against a corrupt president whose salary we have paid to play golf a third of his time when he wasn’t trying to cut a deal with Vladimir Putin. Clearly, Trump was not prepared for back-talk from a powerful woman, particularly one who stood before him fully clothed. Oh, about the military aircraft: That’s how Malania flew the same day to Mar-a-Lago.